Yes! I have found something else to link to since I have totally slacked for the past couple of weeks! What can I say...I am enjoying every last bit of time I can get at home with my husband and boys before they go back to school tomorrow and I go back on Friday. Where did the summer go? But-I'll be the first to admit that I am glad on one hand that summer is drawing to a close because it means I am about 10 weeks closer to having this baby girl in October! Poor baby still has no furniture and her room is waiting to be painted...and I'm sure it was on the "to do" list this summer. The Lightning McQueen motif will totally clash with her bedding, so we need to get on it! 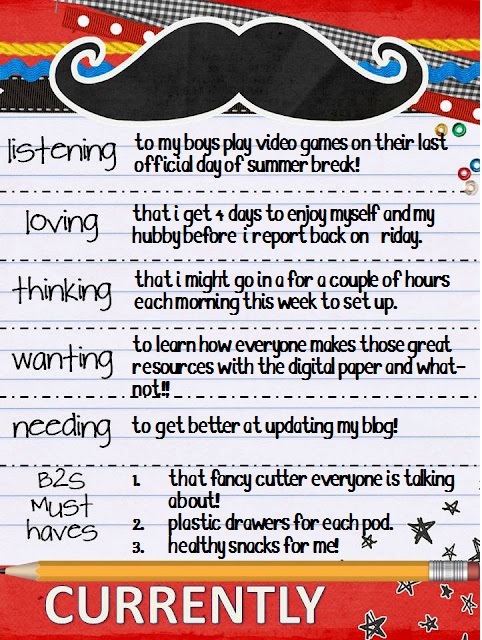 I'm thinking it will give my hubby something to do while the boys and I are back at school and he is alone ALL DAY. I mean...what else could he possibly have to do? (Besides take kids back and forth to appointments, school, sport practices, cook, clean, dog training, physical therapy, laundry, bringing me something I forgot and am convinced I can't live without, Cub Scouts, chaperoning field trips, picking up the special lunches I promised from McDonald's for my class) We'll see! But on with Currently! And seriously...how do all you fabulous bloggers make all those great resources? I'm thinking it's digital scrapbooking paper and what-not, but have you ever tried to Google how to do it? Well, let me tell you...I couldn't' find it anywhere! I hate to be that person to email someone and say, "Hey, what you do is so cool! How do you do it?" But I'm about to that point! This is my first time to link up, and I think it turned out great! Head over to Farley's blog to check it out! I officially head back to work on Friday, but I'm going in for a few hours each morning this week to set up my room and help with some registration testing. We're trying a new class placement system this year, and I'm anxious to see how it all works out! I've been doing a little digging up on how everyone makes those awesome resources too! It looks like many of them use PowerPoint. Some of those teachers are so creative! Congrats on your baby girl! Have a great school year. I go back on Tuesday! Enjoy the rest of your break! Extra Special Teaching has some good resources on using PowerPoint. I have a page called Blog Baby Blog that has tutorials on using Pixlr. Good luck! I'm definitely heading in this week for a few hours at a time too! It's hard to believe that the summer is winding down already! Enjoy your last few days off!